We've been a one-car family for a few weeks, which requires a bit of coordination to make sure both of us can use the car when we need it. Steve needed the car, so he hollered from the other room, "What are you doing right now?" I hollered back, "Witch craft!" His expression as he walked into the room was pretty funny, but maybe you had to be there. Here's what Trevor and I were doing. As I said, witch craft. This is another project from artsy_T's Flickr page. She made these witches with 5th graders, so I wasn't sure how much adapting I'd need to do for my 1st grader to be successful. As it turned out, not much. Supplies: various colors of cardstock (or construction paper), scissors, lace, and glue. 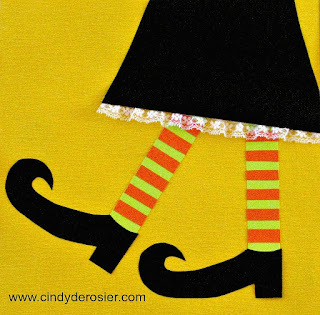 First, Trevor and I each drew witch shoes on scraps of black paper. I was able to hold two pieces together and cut them simultaneously in order to get two shoes, but Trevor couldn't do that. So I attached a binder clip to his paper, which made it simple for him to cut the two pieces at once. As he cut a section, I could move the binder clip as necessary. We placed the shoes on yellow background paper, then cut a skirt shape from more black cardstock. Nothing is glued at this point. Next, we cut legs from a bright color and put them in the correct location. We used a second bright color to create stripes. Once the stripes were cut, we glued them to the stockings. 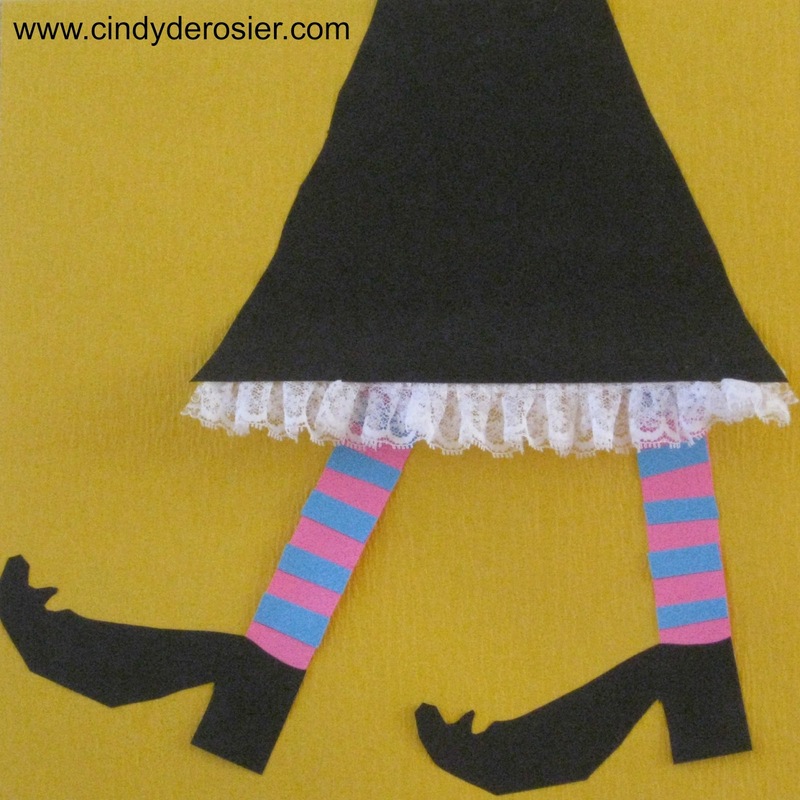 Then we glued the shoes over the stockings and glued the legs to the background paper. Finally, we glued lace to the back of the skirt hem, then glued the skirt in place. Here are all three, now displayed on our wall. I am in love with these. These would look so cool displayed down a long school hallway. 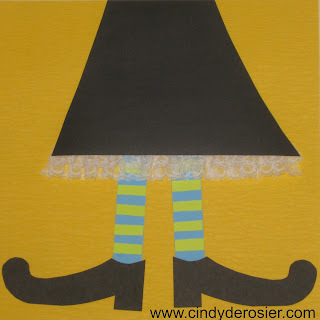 What a fun way to use up cardstock scraps! Thanks for letting me know. I have no idea why. I'll reload the pictures. So fun! Love these. Great way to use up those scraps! Absolutely adorable!!!! Way to go!!!! Witch craft! LOL. This turned out SUPER cute! cooooool ! j'adore c'est une idée originale et décorative, merci beaucoup de le partager avec nous.